as much as loving dazzling white sand beaches, i too love snorkeling. 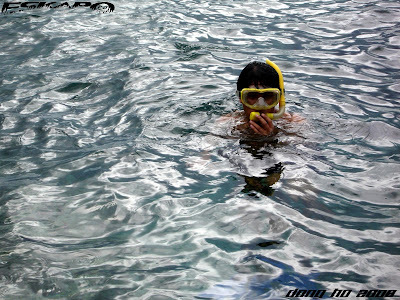 just weeks back, my brother decided to go to Anilao to bring our father for snorkeling. if there's someone to blame why we love snorkeling so much, it will definitely be our father. 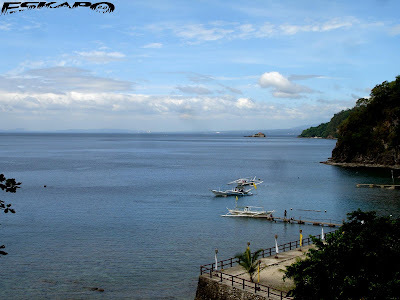 if you remember last April, we also went to Anilao for a day trip and i posted it here. 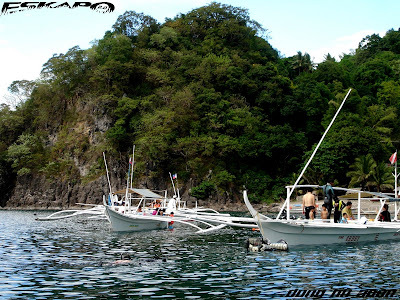 we chose Anilao Outrigger Resort during that time but we then figured out that Dive n Trek Anilao is still the best resort for snorkeling. so we chose the latter. 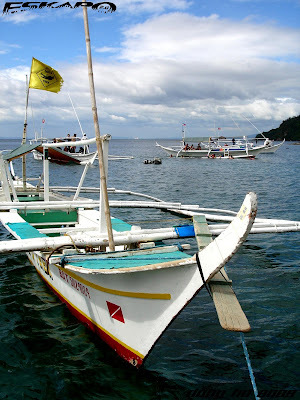 this is my second time to visit Dive n Trek, last was in 2006. unlike Anilao Outrigger Resort, for you to reach Dive n Trek, a motor boat will have to transport you there. 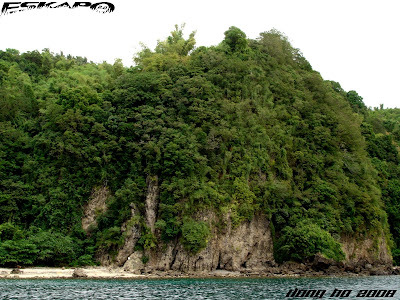 it is located and surrounded by a rocky cliff. though you can access it by trekking, but that would take an extra time. 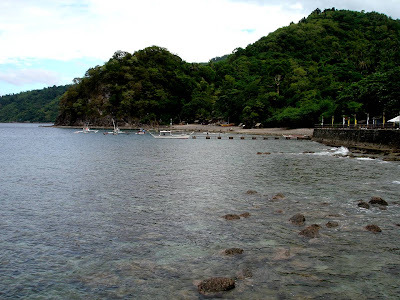 last time we took the route via the Anilao port, this time we decided to take the route via barangay Ligaya. though both way will have almost the same length of boat ride, the road trip is less busier on this side. 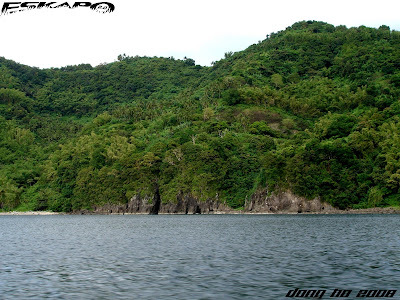 boat ride is just about 10-15minutes passing by rocky cliffs covered densely with trees. the boat ride i should say on this route gives you more great views compared to the other route. we passed by some other resorts within the Balayan bay. since it was still off peak season, we were traveling on a special boat trip which allows us to enjoy every moment of the trip. water was quite good due to a fairly good weather, which also means that we will be enjoying snorkeling. boat docked and from there we have good view of the resort. if you are not familiar yet with Anilao, it is part of the Verde island passage which is the world's center of marine shore fish biodiversity, thanks to Sir Howie Severino for sharing me this article on the official proof. because i got confused that sometimes, Rajah Ampat in Indonesia also claims this title. 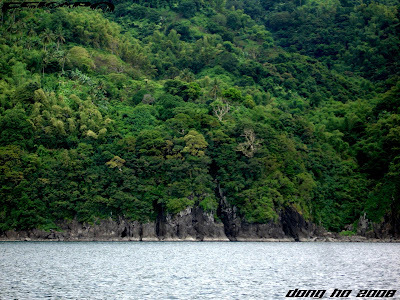 being part of the coral triangle of influence of the world, you can expect endemic species here. Dive n Trek, is popular to snorkelers because of the abundance of giant clams. several clam seeding were conducted here years back. with less cloud and enough sunlight, you'll easily find giant clams all over its area. fishes of different types is a usual sight but the rewarding thing is when you get to find those rare big fishes, eels, lion fish and at times octopus. after crossing the area, took our lunch and rest for a while. food here is already included in the package. food is just fine nothing special but the "Turon", which was served during the merienda was the best there. i almost wanted to ask the cook if she can go with us in Metro Manila. the accommodations are quite good as last time we were here we stayed for two days and a night. the view from the top most deck is beautiful. you can see the reef of the snorkeling area from there. 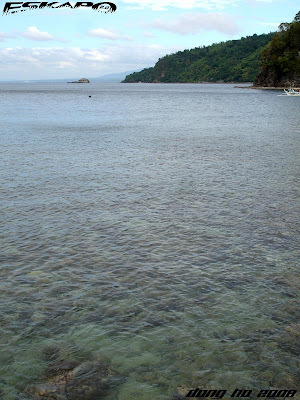 among the many snorkeling sites in Anilao, Dive n Trek has the highest rank along with some other few sites. 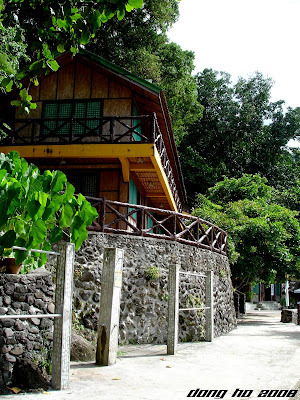 based on our experience, from the many times that we've visited Anilao, i highly recommend Dive n Trek Anilao. why? 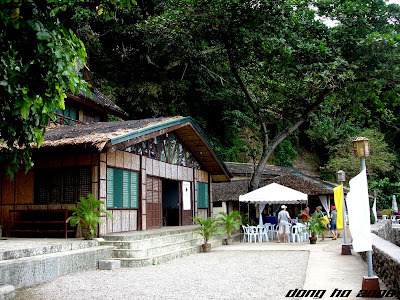 because they have a contained and well preserved area of sea species and the best "Turon". thanks to my brother Lucky (featured in the photo below), for this treat. my father and mother definitely had a great time. this is my last travel post for this 2008 as upcoming posts will be a series of a year-ender posts. our tandem trip with travel bud lawstude will be featured next year. wow, paskong pasko pero parang gusto kong magswimming. comment lang, sana ilimit mo sa 1-2 posts ang nasa mainpage mo kasi masyadong matagal magload sa dami ng pictures at info. those cottages are nice! this place looks so familiar. i know i haven't been here, but i had a bad dream of a place that looks exactly like this 1.
nevertheless, i love your pics, kuya dong! merry christmas. great family time dom, and it was indeed a great 2008 for traveling and ayos na ayos 'coz u decided to end it with family moments. 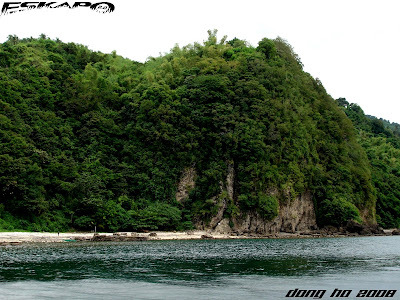 i was still in highschool when we went to anilao (di pa uso digital cam noon), i hope to go back there sometime next year. Looks great. Parang gusto kong ayain yung barkada ko dyan next year. How much do you think should be our budget if we want to do snorkeling there? Thanks for these beautiful pictures! Merry Christmas Dong! Kakainggit kayo Dong! Sarap ng happenings nyo! Si Lucky ba lahat nagbayad? Hehehe. Salamat kay Lucky at nakapasyal ang Nanay at Tatay. Magkano ang package? Hehehe. Para na rin akong nakapamasyal ngayong Christmas dahil sa mga pictures mo. makiki kuya lucky na din ako baka nagbabasa din si kuya lucky ng blog mo..hello kuya lucky...baka gusto mo kaming ilibre ng byahe?? hehehe..
ang swerte ng mga magulang nyo dong at nagkaroon sila ng mababait na anak. ayos ang bonding time ..ang saya.. 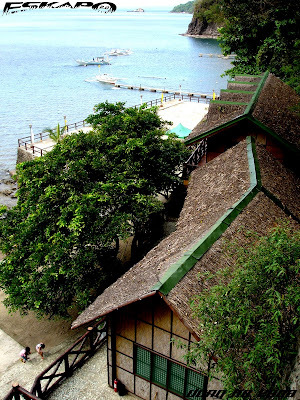 The view of Anilao is Great!! Never tried snorkeling before? How does it feel? Great? these are all beautiful shots! 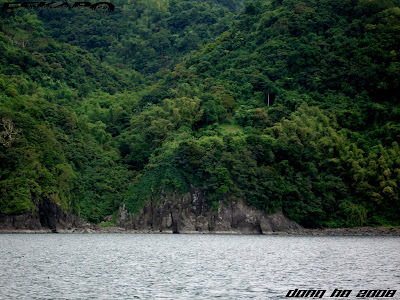 love the rugged cliffs covered in green. 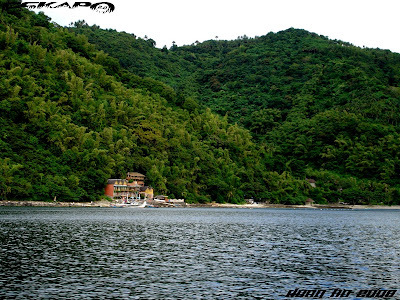 good to know this place is the top marine sanctuary...been to anilao ages ago, i should revisit soon. 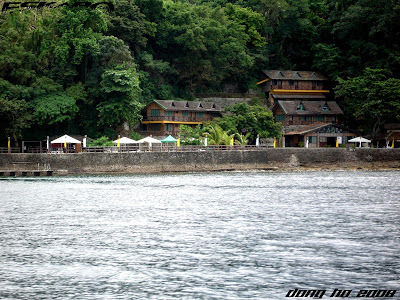 yup, that's the anilao I know. great time with family ah. hindi ko alam may lil bro ka pa. kala ko kaw ang youngest. teka, hindi pa kita nakita na lumalangoy. ay oo nga pala, kaw ang photographer. wow, what a serene place.... belated HAPPY CHRISTMAS to you and your family, Advance Merry New Year!!! It's so refreshing to know that there are hidden and unpopular dive site. Well, maybe it's already popular but I just don't know. Never heard it before, to be honest. Pictures are really nice. I loved it. This looks and sounds like a great place for snorkling. I enjoyed your photos and stories so far, and will be looking forward to your next year's travel stories from other parts of your beautiful country. PS. I like the cottage designs. Looks like a cool place to stay. OH, and MERRY CHRISTMAS, Dong Ho! Great photos. That sounds like a great family activity. My hubby's cousins frequent Anilao. They love diving. My hubby wants to give it a try too. Haaay… I wish I didn't have a phobia of being in open sea water. I know I'm missing so much beauty! I can only share in it through photos. sarap naman ng 2008 year end nyo, family bonding! mahirap ba mag snorkeling? never tried that in my life yet..
that looks fabulous, cant wait to see my son grow, so me and him can do things together like you and your dad! It's good to know that you visited my blog. And this post of yours is very interesting. I love travelling but not snokerling. However, going to islands is always my favourite. Last two years, i went to phuket just to visit its islands. I hope i can go here soon. Don't forget to pay my blog a visit again yeah? Ey... Fin na yung Bora series? Merry Christmas Dong! God Bless. so lush and so green, i would love it here even though i don't snorkel or dive. just sitting by the side and watching the ocean is enough to satisfy me. Nice place and from a vantage point, I can tell the water is deep. Ideal for snorkeling. Sana donG may pics ka rin below the surface. What a lush and beautiful place. Thanks for taking us along. Beautiful pics... Stopping by via Philip's Travel Blog... My aunt and uncle are moving back to the Phillipines in Jan.. They live on Negros... Can't wait to visit them..
Any time of the year is best for visiting Malaysia. However try to avoid school holiday as hotel will be fully booked and the room rate will be increased. For Sabah and Sarawak, it is best to avoid visiting these 2 states at year end as it rain quite frequently that period. Another wonderful trip. Thanks for sharing these very fine views, Dong. I have not been snorkeling for years! It's enjoyable to see the beautiful underwater world. I've only been to the east coast of Peninsular Malaysia for snorkeling. Singapore waters are not clear enough. 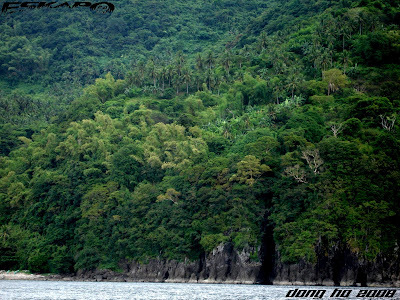 Anilao is beautiful, thanks for sharing the trip, bro. Merry Christmas! I hope you are having a wonderful time this holiday season. The views are very nice. I didn't know Anilao could look this good. My friends from WWF invited me over but I didn't join them. I can't dive kasi. Hehe..Sayang pala. great photos! but i also wanted to say your merry christmas stamp with the parol rocks! hi there where are the fishes? >biyaheng noypi, sarap nga pagbakasyon. inaasam asam ko nga ring magswimming. ill try my best, kasi plano ko rin talaga i-reduced ang post sa mainpage kaya lang yung ibang readers medyo late na yung pagbisita kaya kung minsan hindi na nila nababasa ang dating post. siguro reduce ko by 5 posts on the mainpage next year. salamat sa comment. >hi acey, hahaha... galing naman ng panaginip. salamat. salamat. >oman, oo iba din talaga ang family time na byahe. relax lang talaga at kwentuhan. puntahan mo ang anilao. at kung pupunta ka, sa dive n trek ka kasi sulit na sulit ang underwater view. buhay na buhay ang mga corals at ang mga isda hindi takot magpakita sa tao dahil sanay na sila. 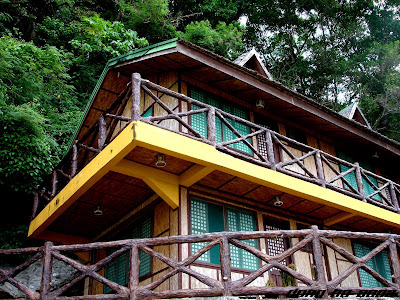 >gillboard, a daytrip would usually cost you around P1,200-P1,500 exclusive of travel cost. magandang barkada gimik doon. abangan mo baka mag organize ako ng trip papunta doon, inform kita. >dennis, salamat din sa pagbisita. >borneo falcon, that's the advantage. cheaper rates and fewer people. >mike, salamat. si kuya ko nga ang nagbayad. pag day trip usually nasa P1,200-P1,500 ang rate exclusive of the travel cost from manila to port. try mo. abangan mo rin at baka mag organize ako ng trip doon next year. >hi doc rio, hahaha... sana nga mabasa nya ito. sarap nga ng time na kasama sila. bihira din kasi kami magsama sama. >hi alicesg, yes because it's our father who made us appreciate snorkeling. thanks for always taking time to visit my blog. >victor, you should try it. i highly recommend snorkeling specially in your area as you are also part of the coral triangle of influence. >hi cindyrellaz, hehehe... try mo lang kahit sa mababaw na lugar. ganda talaga pag off peak. >pusang-gala, subukan mo talaga ang anilao. buhay na buhay kasi ang mga corals doon. >hi vanny, it's really good to know you're back. though you're not yet completely recovered. im sure you'll get better soon. thanks for dropping by despite your condition. >hi luna, im also amazed at the density of trees on those rocky cliffs. you need to visit it again. it still is beautiful for snorkeling. >utoysaves, galing naman. salamat sa pag alaga sa anilao kasi daming benepisyo ng lugar na yan sa bansa natin. >redlan, mas matanda si kuya ko. bunso ako sa magkakapatid. may kuha din naman akong nagsnorkeling kuha ng nanay ko. >hi ailee, thanks for the advance greetings! 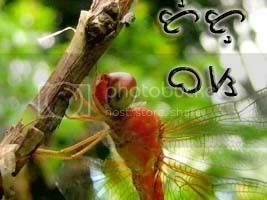 >hi myslykemeeh, it is usually popular to people who are really into diving or snorkeling. i recommend that you try it. you'll enjoy seeing the sea creatures in their own environment. 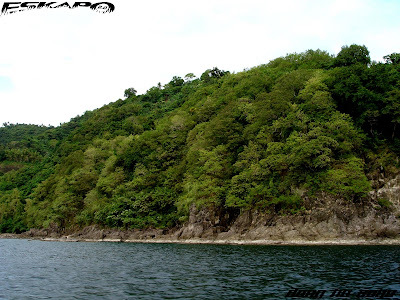 >richard, hindi ko pa nasubukan doon pero ang alam ko in general maganda naman yata sa ibang sites ng anilao pero i still recommend dive n trek. >eki, thanks a lot. 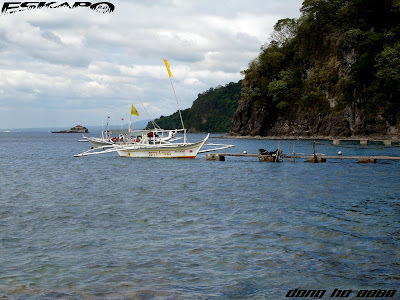 this is one of the best snorkeling sites in the philippines. 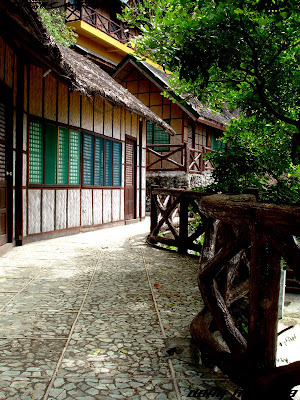 just tell me if you'll be visiting the philippines, we'll tour you around or might even join you to anilao. >hi rachel, tell him to try it. im sure he'll enjoy it. >hi grace, that's true. remember we have 7,107islands to discover. hehehe... christmas was great. stayed at home attended mass duirng the christmas eve. how bout you? >eel wind, yes it definitely is. thanks for dropping by. >hi hilda, just give it a try. there are shallow areas where one can enjoy without the fear of the open sea. didn't know that some areas in palawan are already destroyed. that's a sad news. >hi chubs, sarap talaga lalo na pagkasama lahat. >hi misty, it's not difficult. because you also have the option to wear lifevest if in case you don't know how to swim. i highly recommend that you try it. >joops, hahaha... that'll be cool. >willie, thanks too for dropping by. i also want to visit phuket and the phi phi islands in thailand. maybe soon. ill be dropping by your blog soon. >hi vic, try it. you can bring everyone in the family. >jasper, oo tapos na ang boracay series. bitin ba? >nanaybelen, opo sa batangas po ang anilao. try nyo pong pumunta ulit. dami na ring nagsulputang resort dahil sa kagandahan ng mga isda doon. >hi med, thanks a lot! >photo cache, you should try snorkeling. it's something one shouldn't miss. though sitting by the beach shore is fun too. thanks for the advance greetings. >blogusvox, maganda talaga magsnorkeling doon. sorry wala pa akong underwater camera kaya wala talaga akong maipakita pero dami namang video sa youtube featuring anilao. >hi ailee, that's really cute. thanks too for dropping by. >hi joy, that would be great! ill get in touch with you thru email on that. thank you! thank you! >hi sandy, as always. my pleasure. thanks! >hi leesa, that would be great! 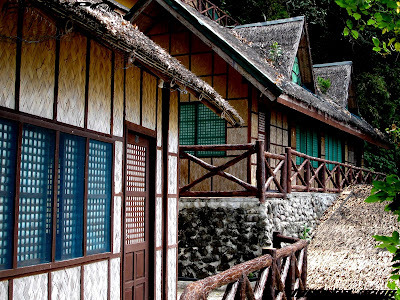 negros has a lot to offer as well. i was there between september and october. hope to see you soon here. i can be your tour guide. hehehe... just keep in touch. >borneo falcon, thanks a lot for the tips. ill get in touch with you thru email. thank you! 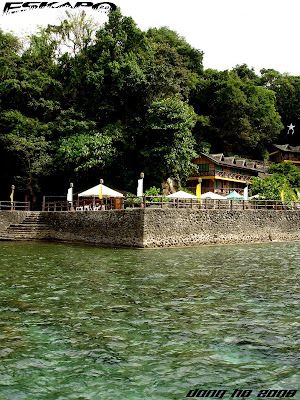 >hi eastcoastlife, anilao is popular to diving and snorkeling enthusiasts. a lot of people don't know this place yet. >pietro, thanks too for dropping by regularly. >hi eunice, you're always welcome to dive or snorkel here. we'll welcome you anytime. just inform us. >dencios, kaka-enganyo nga talaga na pumunta doon lalo na pag habol mo ang underwater scenes. >dennis, salamat din sa pagdaan. >hi tink, hahaha... don't worry. just wear a lifevest. thanks for the greetings! i wish you the same thing. >panaderos, yes it is. you need to try this. thanks for the advance greetings! >reena, you should have grabbed that opportunity. dont worry i might organize a trip there. i will inform you. >hi faery, thanks a lot for the greetings! >anonymous, sorry because i dont have an underwater camera. but you can always check underwater video footage of anilao in youtube. have a great time! Happy New Year, kuya dong! More of you this 2009, kuya dong!